School Pan flutes There is 1 product. Pan Flutes intended for teaching and basic introduction to the musical instrument. Flutes are designed for beginners, children or schools. 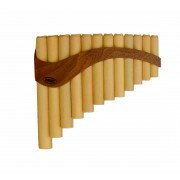 Twelve-tones Pan Flute made of robust bamboo wood. Designed for kids, schools or beginners. Comes with soft protective case and tuning sticks.